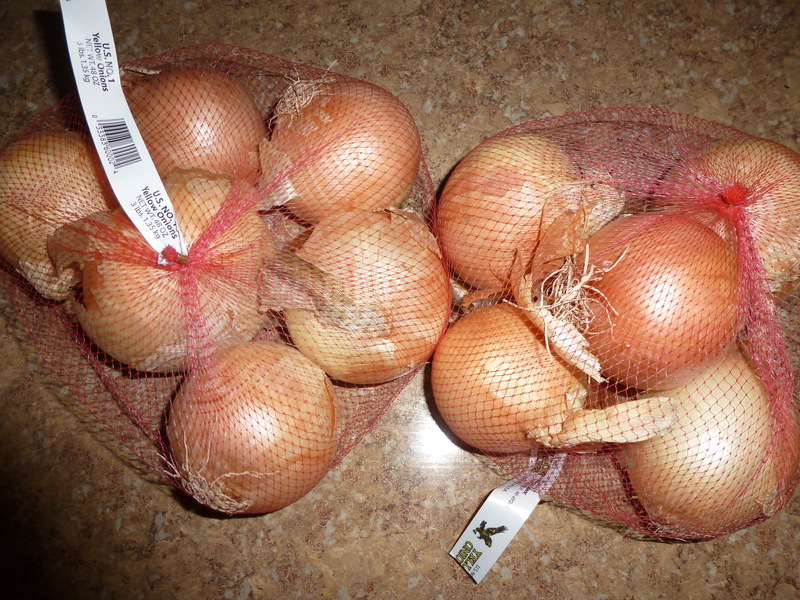 Aldi had bags of onions — 3 lbs for $0.69 — so I got two. Then, I let them sit in my fridge for a week or two because I had no idea what to do with them!! My grandmother suggested I chop them up and freeze them. I tried using my food processor but I thought it chopped the onion too finely. So, I started a chopping assembly line in my kitchen. 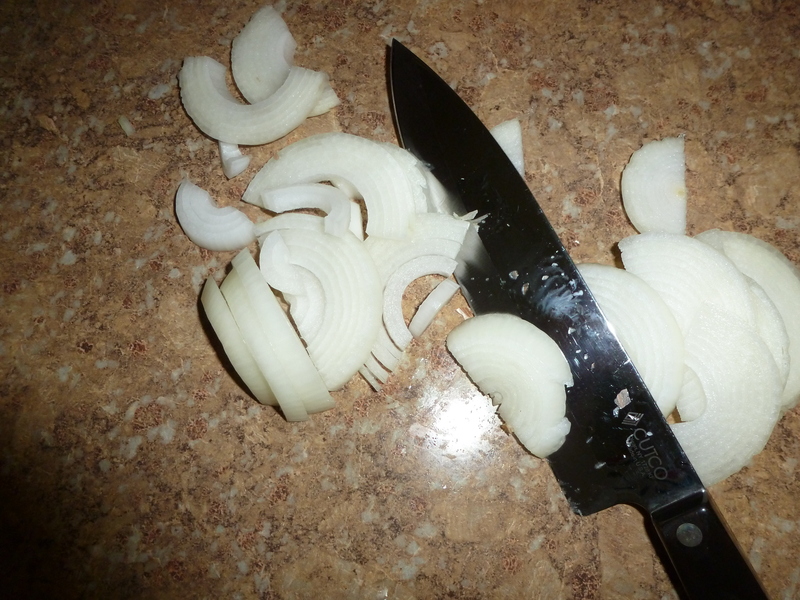 Cut each onion crosswise, into small slices (like rainbows). 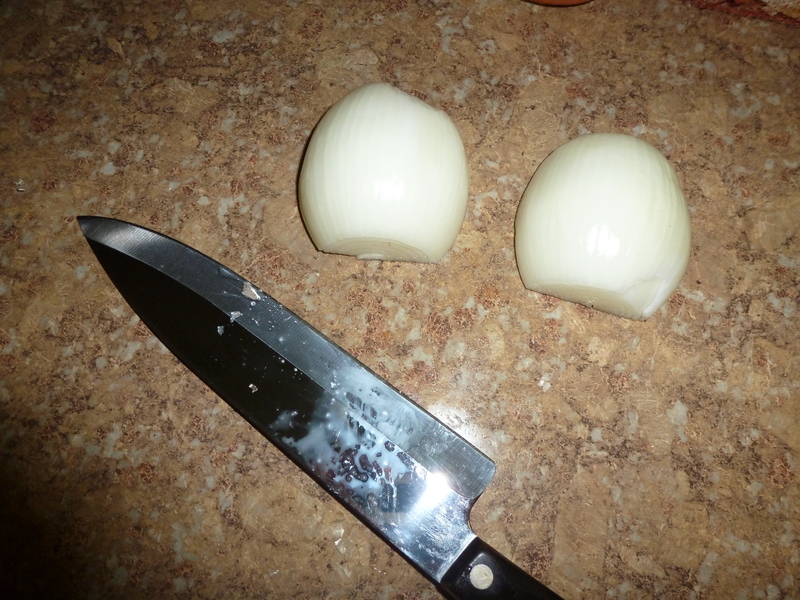 When I was done chopping, I bagged the onions separately for freezing. 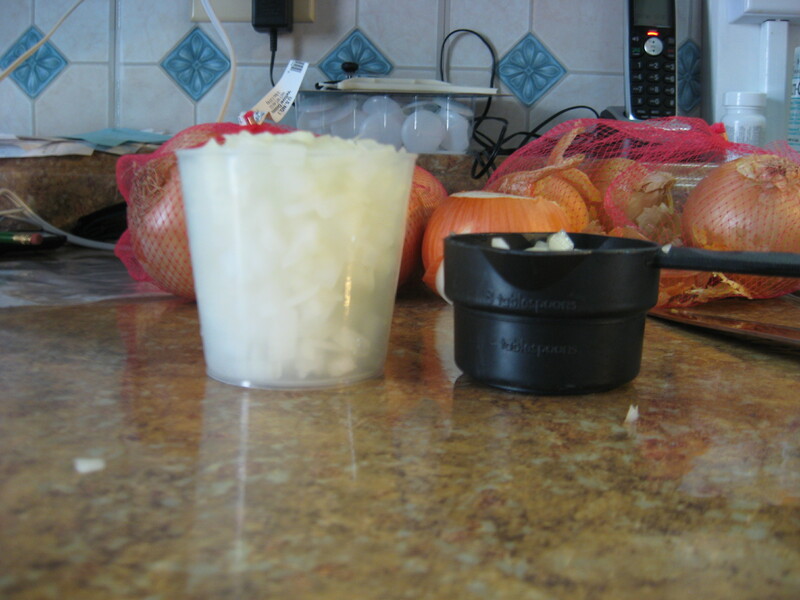 Each onion gave about 1.5 cups of chopped onion. So, I bagged the chopped onion, one onion per bag, and flatted the bags to freeze. You can take out a bag and break off the amount that you need if you need less than a whole onion. Just make sure if you’re using a recipe that calls for less than 1 whole onion, you write on the bag how much is left!! thank you for linking this in to Food on Friday. We are now starting to get quite a collection of onion dishes together. Do stop by some of the other links to check them out! Thanks for following 🙂 I followed you back and I’m sure I’ll be sharing more on Food on Friday! Thank you for this tip. I never thought of freezing onions. I kind of thought it might make the freezer smell. It hasn’t made mine smell. I use freezer bags, so they are a bit thicker. It did make my kitchen smell the day I chopped them up! I had tears streaming down my face, while the repair-man was working on our furnace… I’m sure he thought I was crazy. We grow onions in our garden, we keep most of the harvest in a cold bin in the barn, but I freeze some too. Great post! Thank you so much for sharing with Full Plate Thursday and a very Merry Christmas to you and your family. what a genius idea. my mom does this with peppers but i had not thought of onions! Loved seeing this at the special link party supporting Sandy Hook last week. Hope you’ll come to The Humble Brag link party today to see some features from last week and link up some more cool projects. We also give away free ad space every week! Happy Friday! Hi Kristen. Thanks so much for linking up at Thriving on Thursdays (just before Christmas). I’m a big believer in freezing excess vegies and this is a great tip. I’m featuring at tomorrow’s party, the first for the year. So great of you to pop by at my blog. Look forward to seeing many more great tips from you. Great tip! I so need to remember this next gardening season!